Fungal infections of nails usually won't cause any discomfort for a while although their appearance can be somewhat unsightly. In most cases a fungal nail infection won't cause any further complications and clear of its own accord over time but sometimes causes discomfort if not treated. Most fungal nail infections are caused by dermatophyte fungi, which also causes athlete's foot. Athlete's foot is a fungal skin infection that affects the skin between the toes and can easily spread to the toenails. Occasionally a nail infection can be caused by other types of fungi, such as Candida. Colloidal Silver is a simple solution of distilled water with suspended nanoparticles of real silver. Silver has been used for hundreds of years for its potent antiviral, antibacterial and antifungal properties and is becoming more and more relevant in today's modern world as our current antibiotics become overused and less effective. 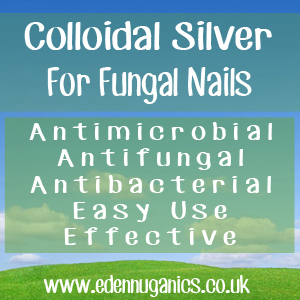 One of the most popular uses for colloidal silver is as a simple, fast and effective treatment for fungal infections. The first step is to cut a cotton pad just big enough to cover the area of the infection. Apply colloidal silver to a cotton pad and apply this to the surface of the affected nail. Next we need to hold the colloidal pad in place over the nail. The best method we have come across involves cutting the finger of a medical glove and using this to hold the cotton pad in place. Duct tape can also be used. This should be repeated 3 times a day until symptoms improve. Normally this takes around a week. To completely eliminate toenail fungus one of the best remedies is to use raw, unfiltered apple cider vinegar. Soak your feet for 15 minutes a day in a basin of warm water and apple cider vinegar at a 1 - 1 ratio. The apple cider vinegar helps to restore the pH balance of the skin and nails, making it more resistant to fungal infections. When you are done, be sure to dry your feet and toes thoroughly and then also wash the towel that you used. Tea tree is another powerful remedy in the treatment of even the most stubborn nail infections. Simply drop tea tree oil onto the affected nail and allow it to soak in naturally. Tea tree oil has been used as an antiseptic and fungicide for centuries. A toothbrush can be used to gently scrub the surface of the affected nail to loosen dead skin cells and assure that the treatment of choice can penetrate well into the nail. Be sure to throw the toothbrush away after using it for this purpose as the fungus can survive on any surface it comes into contact with. Try making a combination of tea tree mixed with olive oil and rubbing in on your nail. When treating infected nails it is always best to wear gloves and wash your hands between applications to avoid spreading the infection to another part of the body. This can be applied as regularly as you would like, although around 2 - 4 times a day is recommended. Without wanting to get too scientific, coconut oil has got to be one of the most exciting and effective ways to combat fungus without using harsh chemicals. Medium chain fatty acids work as powerful natural fungicides. When treating infected nails it is always best to wear gloves and wash your hands between applications to avoid spreading the infection to another part of the body. Simply rub coconut oil onto the area and let it absorb and dry naturally.